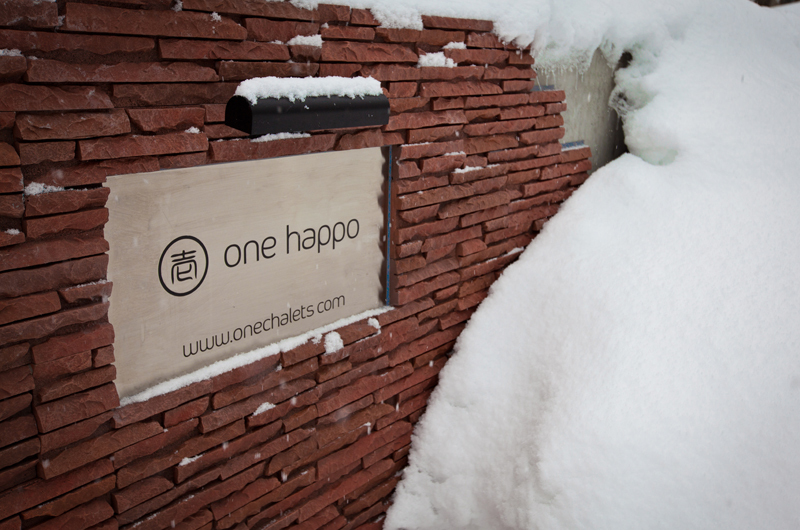 Praised by some as one of the most exclusive luxury homes in Asia, One Happo Chalet is the pinnacle of indulgence for snow-obsessed groups with a taste for straight-up contemporary style. 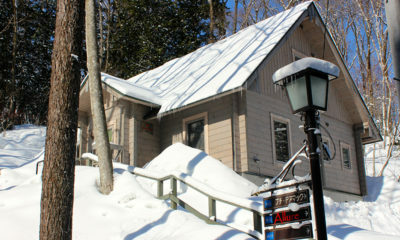 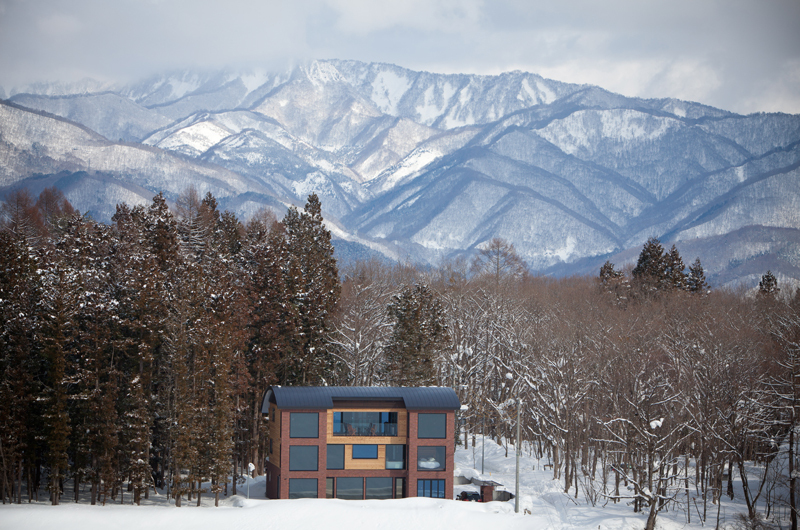 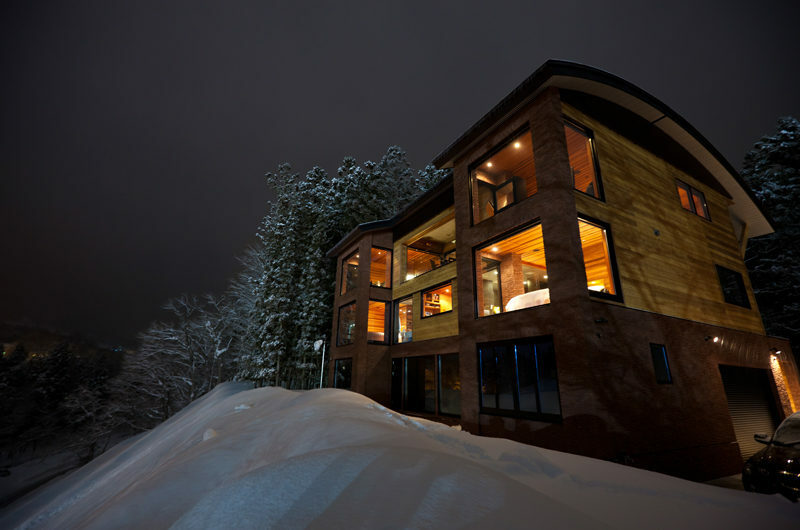 For any other accommodation option in Japan, this chalet’s location alone would be the most essential and celebrated feature. 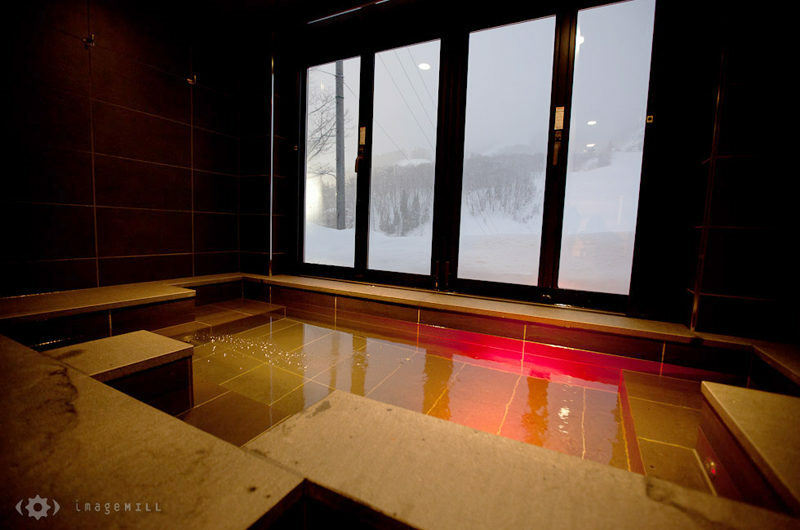 However, for a property of this calibre, its unbelievable views and remarkable positioning next to Hakuba’s main gondola are merely additional details amongst a stunning list of facilities, amenities and world-class details that make One Happo the stunning chalet that it is. Sleeping a maximum of 10 people across 3 floors and 5 bedrooms, One Happo Chalet is made available for rental for a limited 4 week period each season – only heightening the exclusive nature of this very special property. 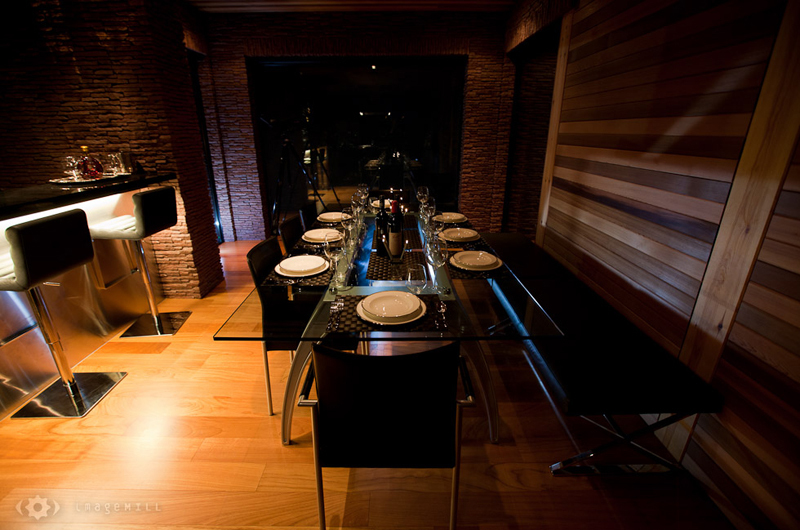 Absolutely no expense has been spared here. 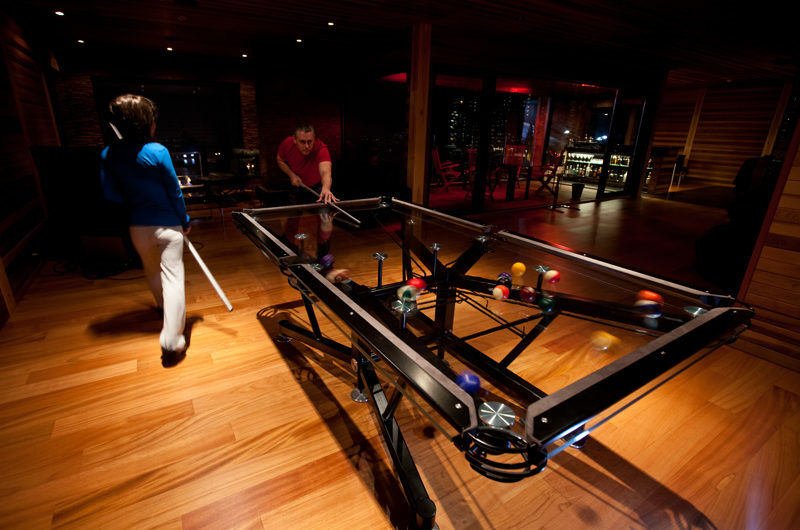 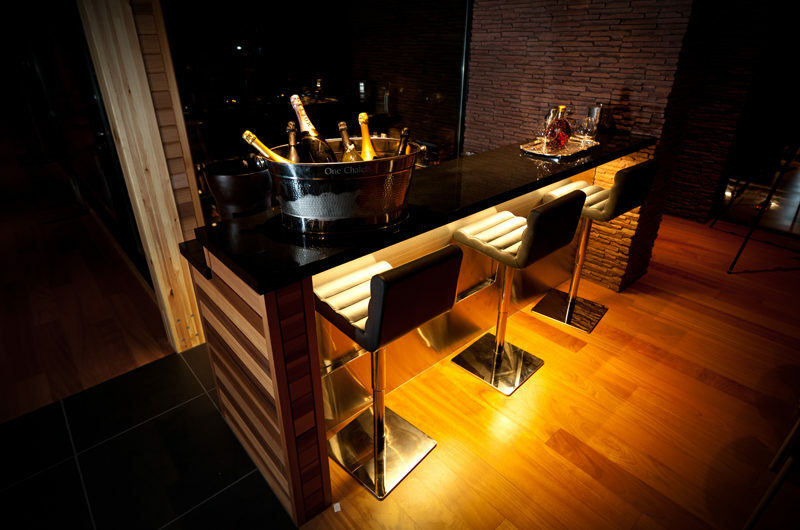 From the glass top pool table in the games room through to the infra-red heated viewing deck, marble-topped cocktail bar and the beautiful teppanyaki counter, all design options have been picked from the top shelf. 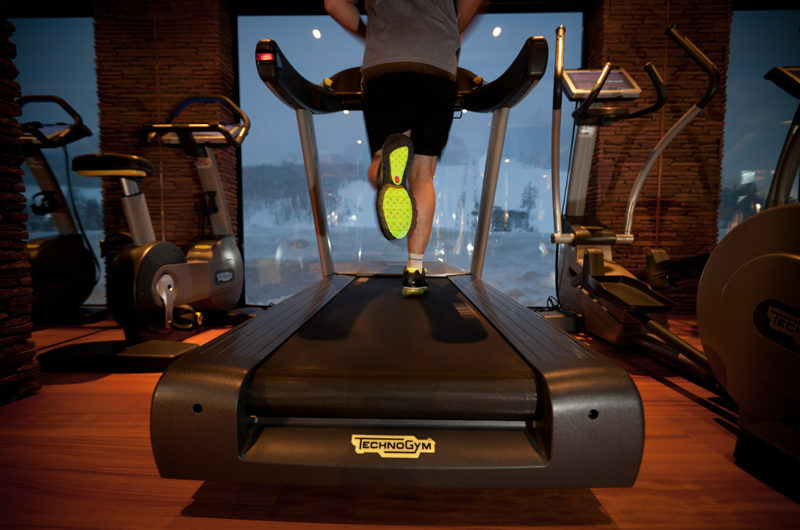 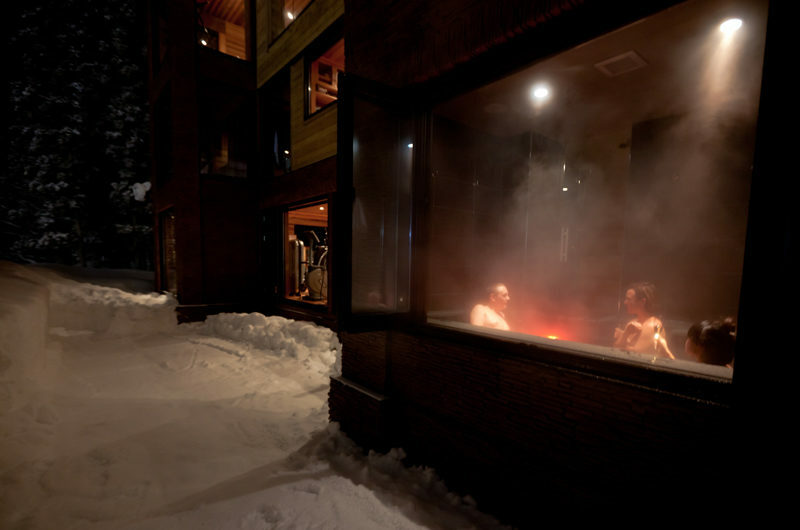 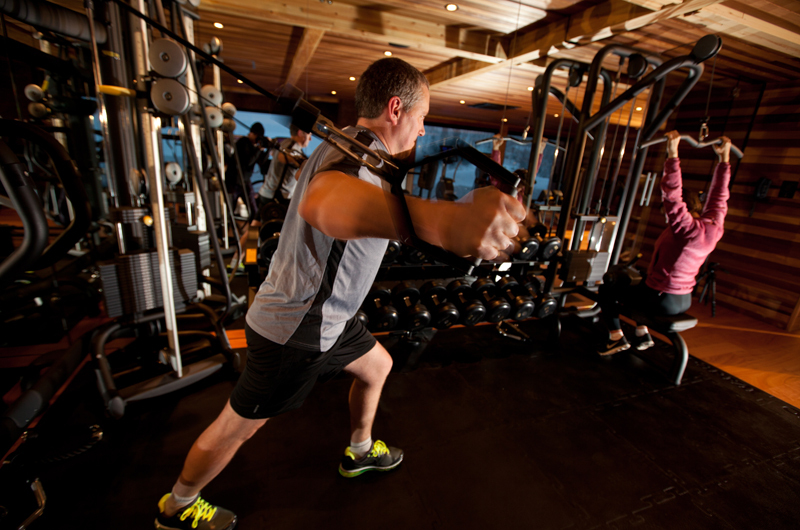 A five-star gymnasium leads to One Happo’s private Onsen (natural hot spring spa) and jacuzzi, boasting stunning snow-capped views onto the Wandano alpine forest nearby. 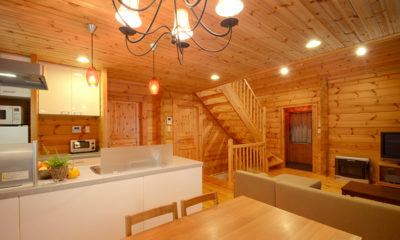 A chalet 4 x 4 vehicle is exclusively available to guests who want to explore the huge Hakuba Valley in its entirety – that is if the 100m walk from the chalet door to the gondola proves a little bit too easy. 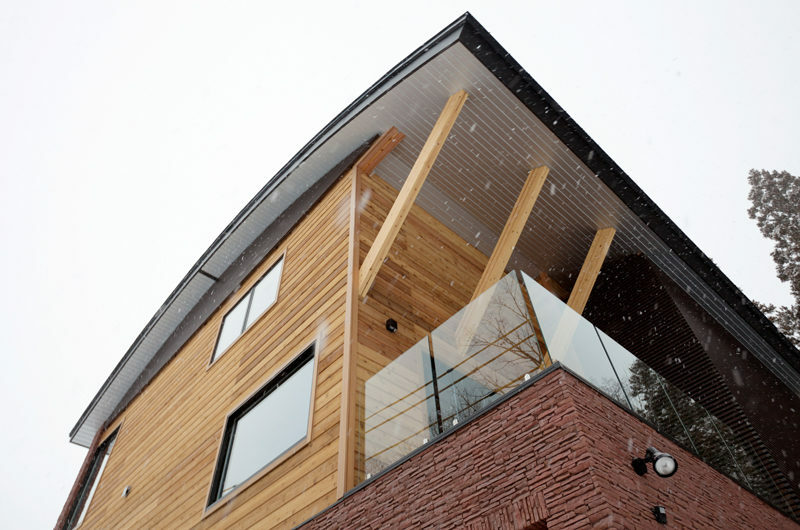 Huge windows bridge the gap between inside and outside at One Happo, as do the beautiful material selections that have been carefully curated throughout the chalet’s interior. 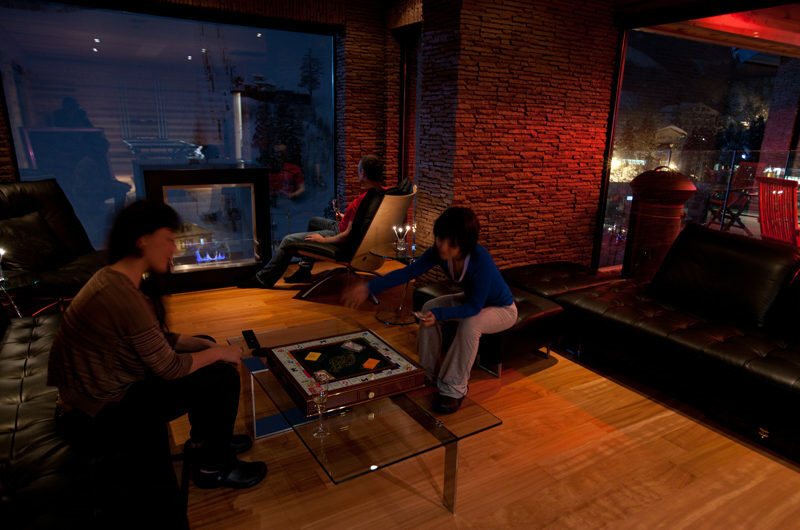 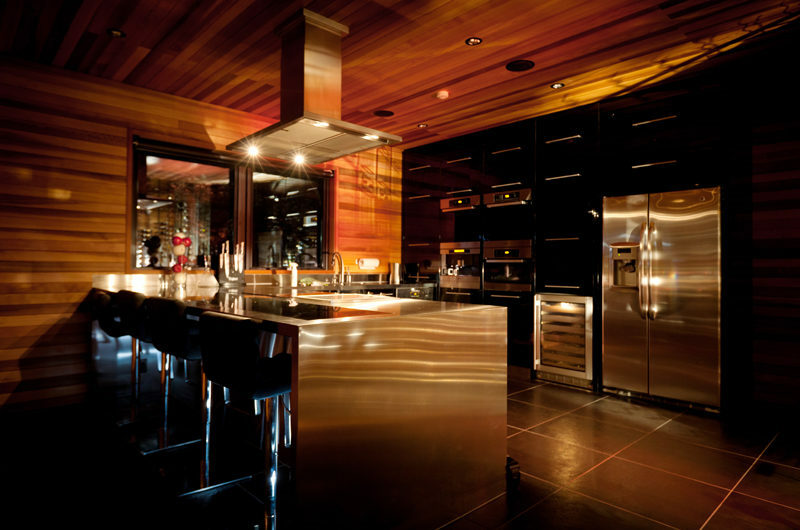 Expect warm red cedar against sleek blacks, glass and marble for a neutral and calm ambiance throughout, as well as a transparent fireplace and a breath-taking floor-to-ceiling glass wine room for those finishing luxe touches. 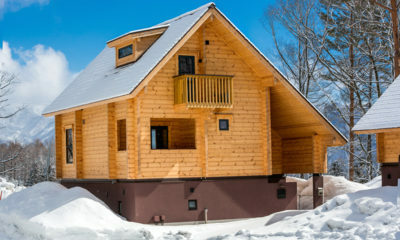 Woodland or mountain-facing views from all 5 bedrooms within this chalet provide postcard moments at every turn. 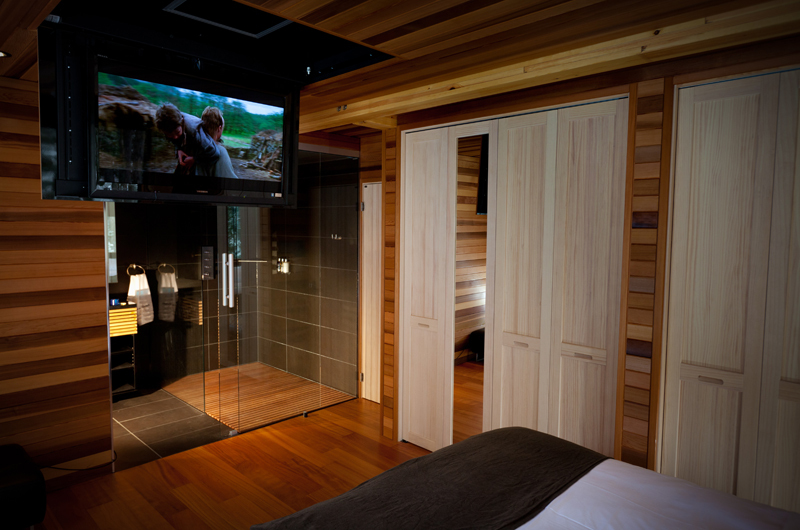 Two King Size Master bedrooms are available, both with ensuite and an incredible selection of material and technological details (including retracting flatscreen 3D television, and iPad controlled heating, music and visual technology). 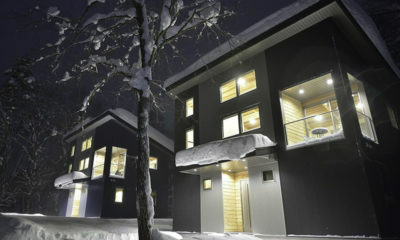 The third and fourth bedrooms offer two single beds which can be pushed into a King Size double on request, and feature the same high standards in terms of facilities, tech and textiles. 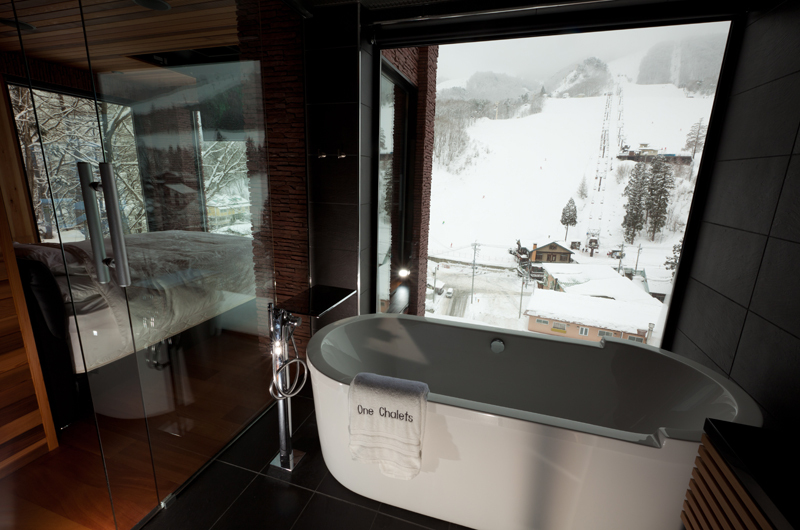 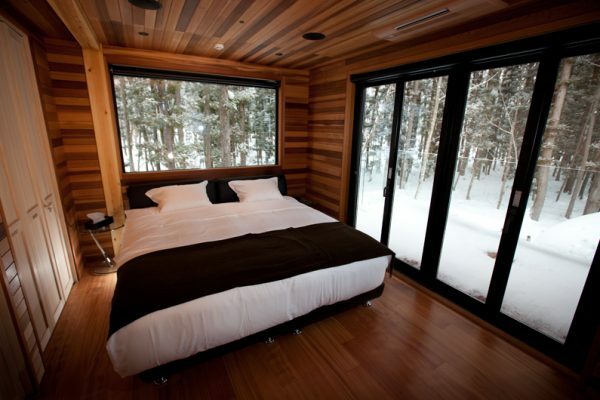 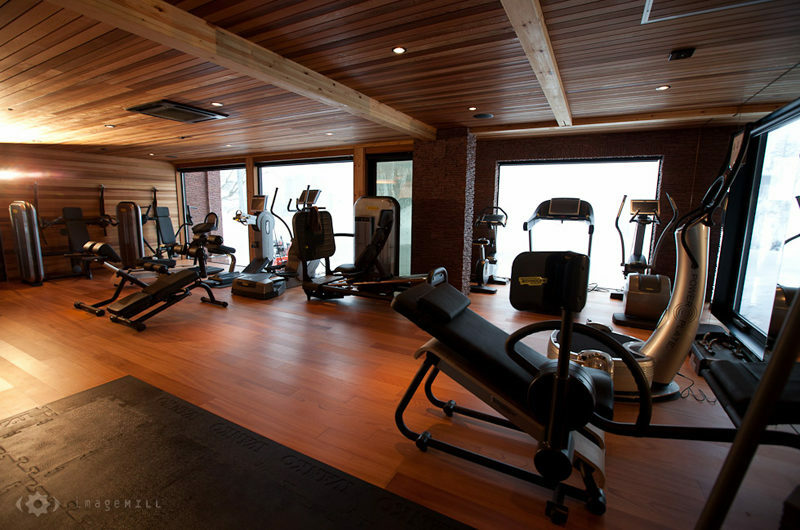 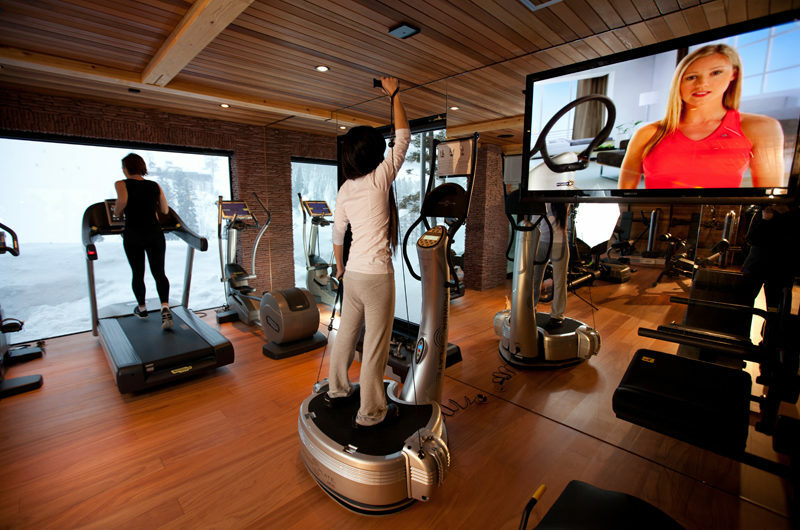 The last bedroom in One Happo Chalet can be used as a playroom or an office, should the Queen Size bed be unnecessary. 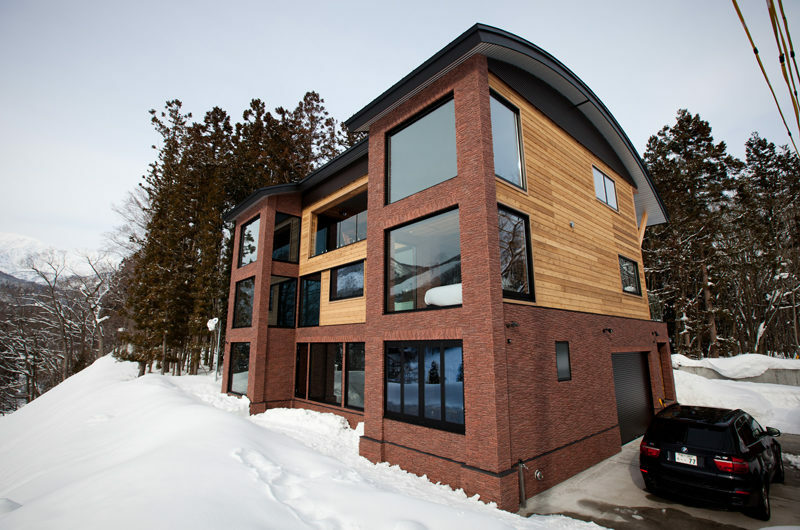 The first two bedrooms are on the second floor, with the ski resort in plain view through floor-to-ceiling windows. 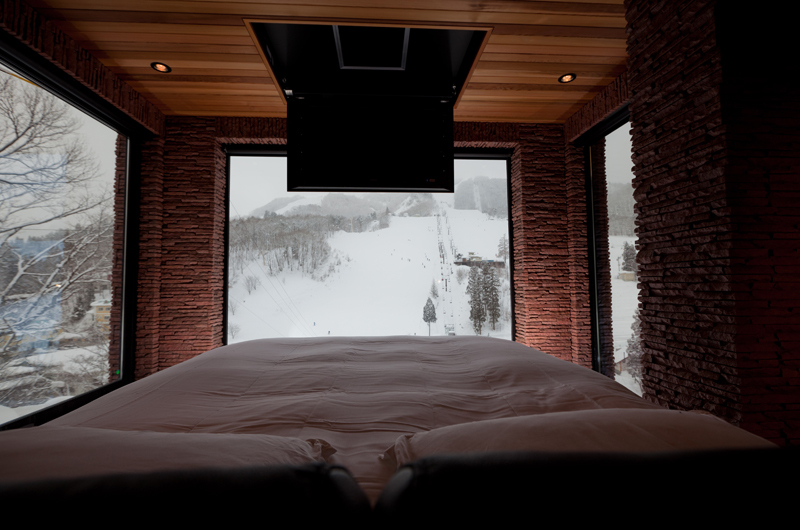 Two guests sleep in each room, with a luxurious king bed looking straight towards the ski hill. 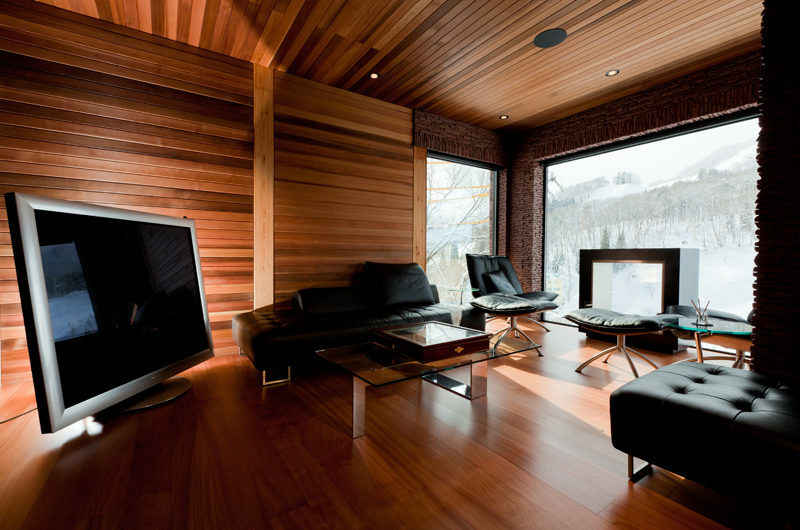 A TV screen can fold down from the ceiling. 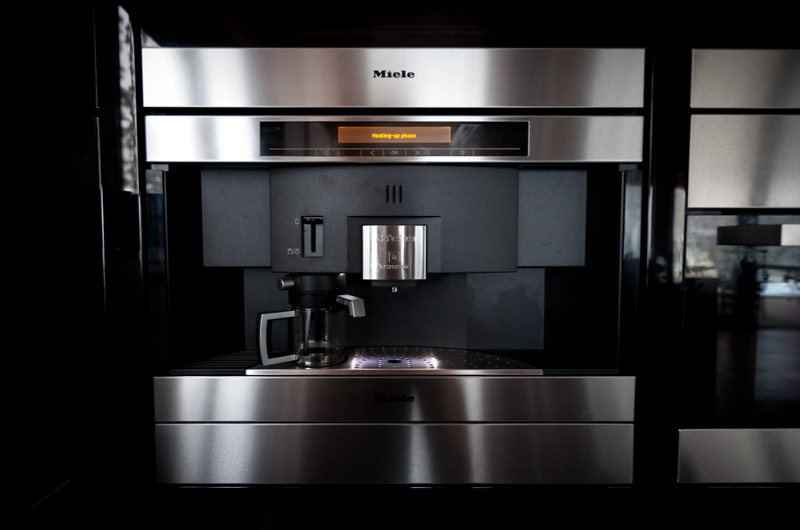 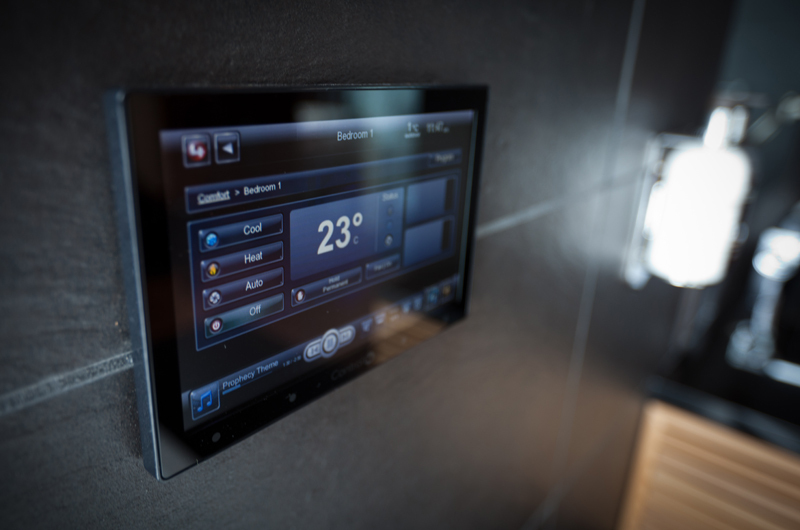 You can control all music, lighting, heating, and entertainment with an iPad docked into the wall. 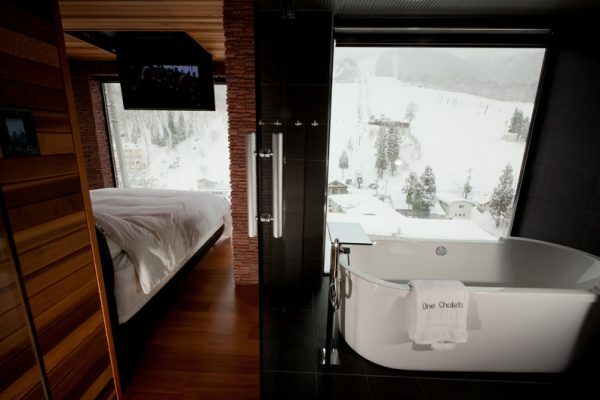 There is a wardrobe with hangers, and en-suite a bathroom with showerhead, vanity, toilet and freestanding bath – also great mountain views to indulge in. 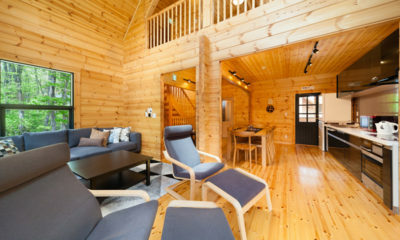 The second two bedrooms are on the second floor, each facing the forests that surround the lodge, and each has decking and private balcony access to enjoy the views. Two guests can sleep in each room with either one king double or two single beds, whichever works best. 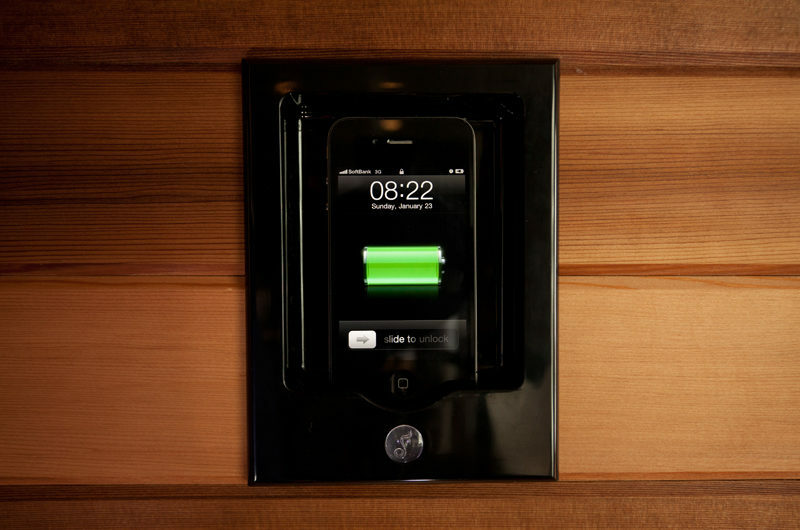 An iPad docked into the wall controls heating, music, and entertainment for the room, and a flat-screen TV folds out of the ceiling. 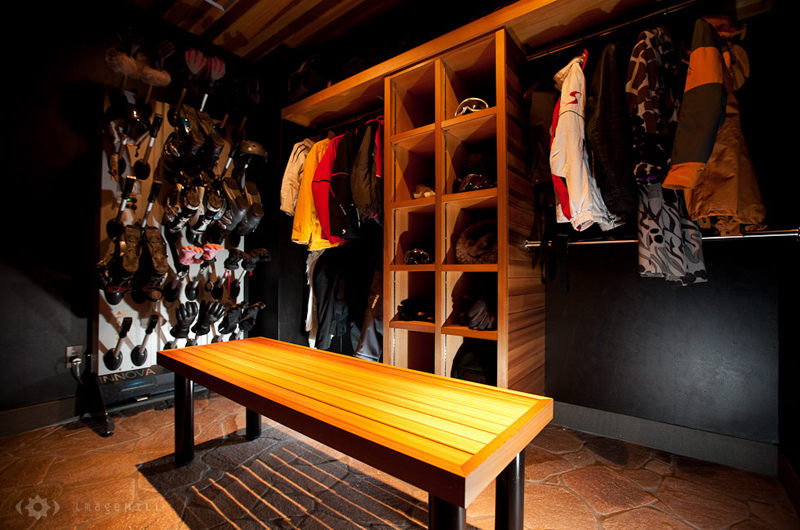 A built-in wardrobe fills all your storage needs. Each bedroom has an en-suite bathroom with rainfall showerhead, vanity, and toilet. 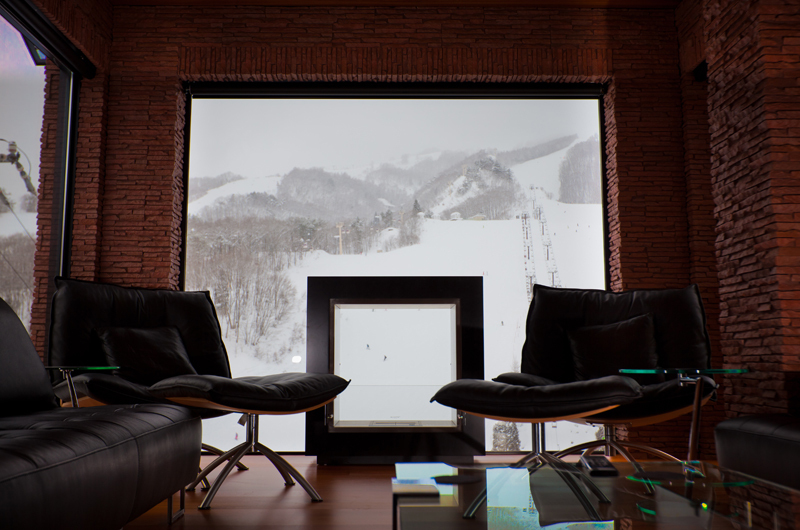 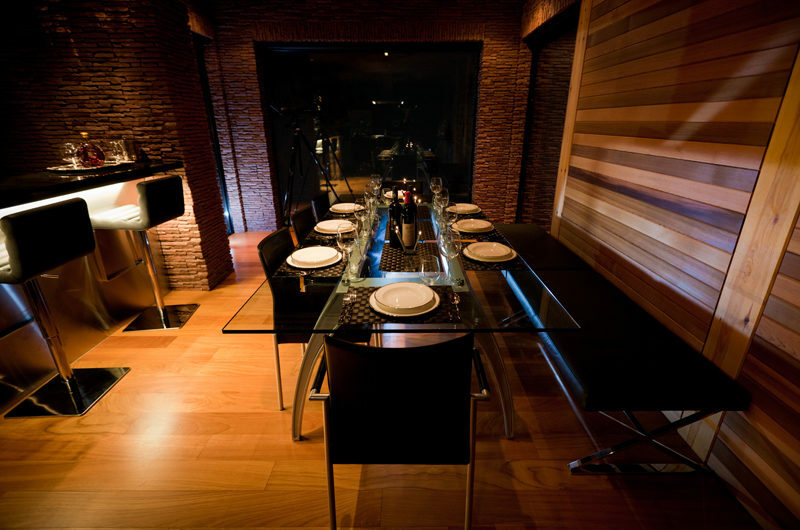 The mountainside office is on the second floor and contains a large retractable wall desk and chair. 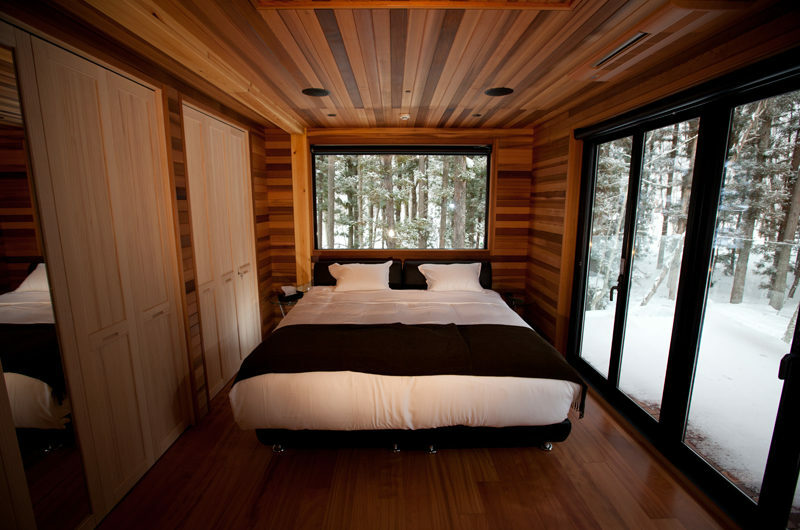 If not used as a workspace, a large queen-size Murphy bed folds out of the wall to make a fifth bedroom. 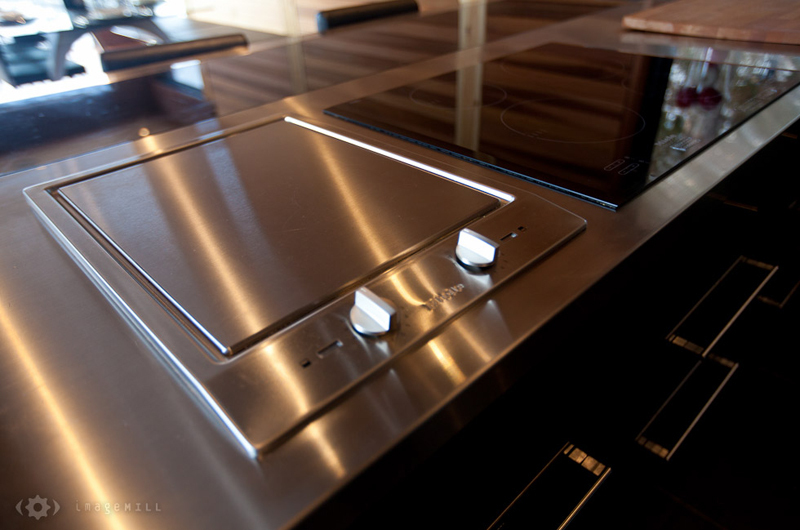 Like all other bedrooms and rooms, an iPad serves as a control panel to change heating, music, and visuals to your desire. 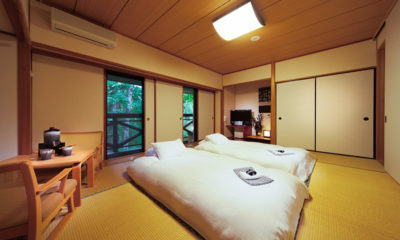 A flat-screen TV is in the room for entertainment. 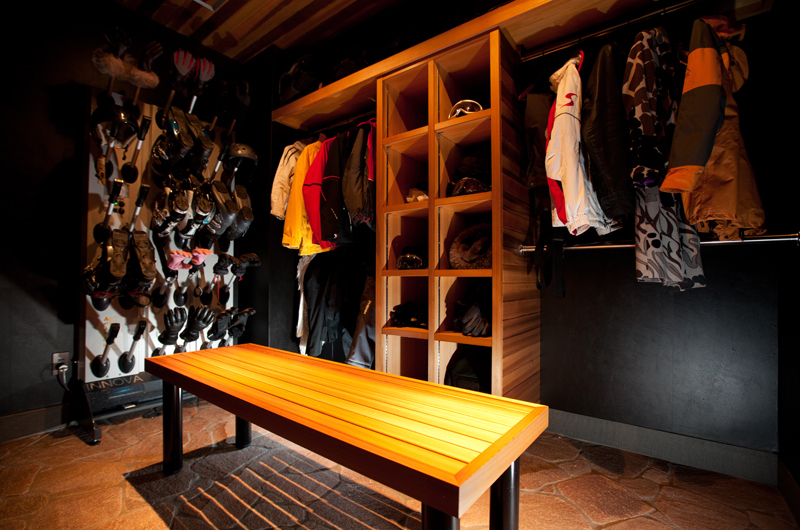 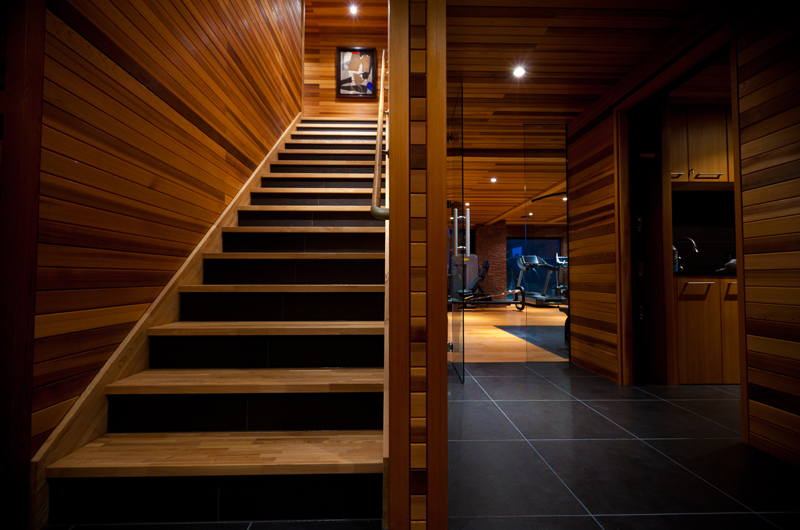 This outstanding chalet faces directly out onto the Happo Ski Resort main Gondola. 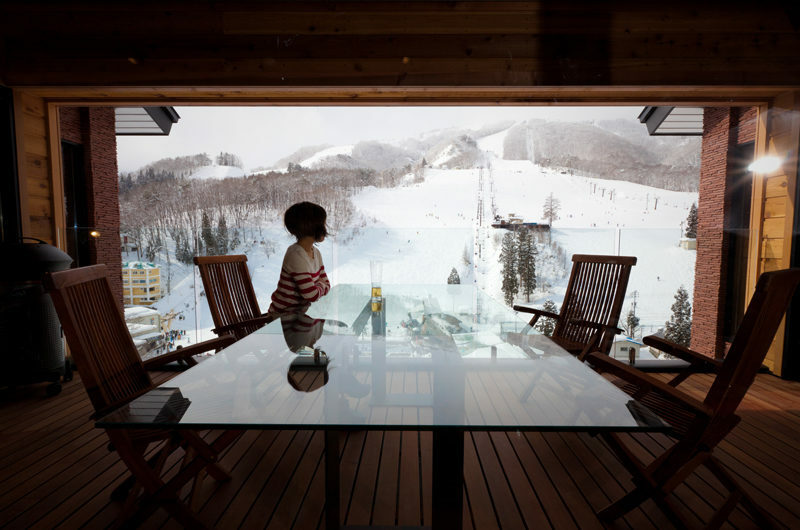 Make the most of the lively resort atmosphere, and soak up the cultural experience of skiing in one of the most popular areas of traditional Japan. 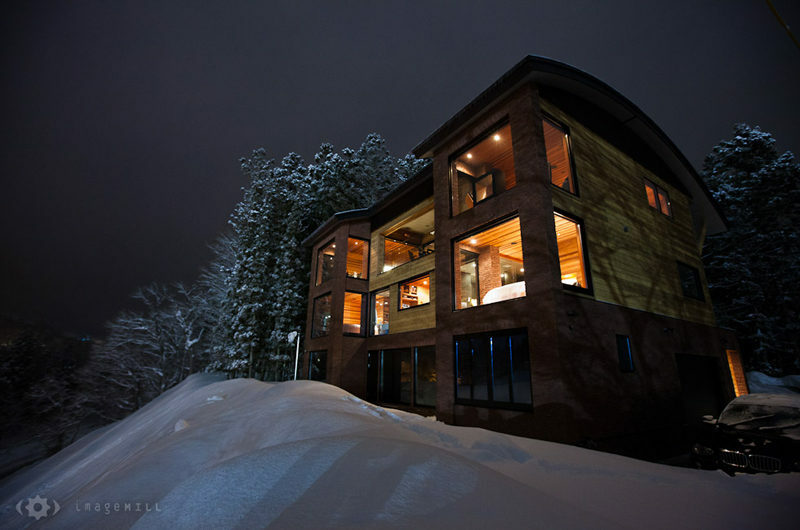 The Happo Ski Resort is literally just 100m away from the doorstep of this incredible property, and quite simply, there’s no better or closer accommodation option to any kind of ski access in the whole of the Hakuba Valley. 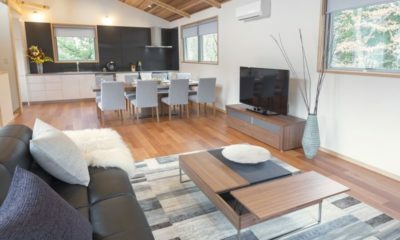 Central to the Happo Ski Resort area, the chalet is a short walk from hot springs, hotels, and restaurants – and with a vehicle provided, all of the Hakuba Valley is yours. Through your on-site concierge or prior to your arrival, the team of caretakers at One Hapo Chalets can arrange all your dining needs with catered breakfasts and dinners on-site. 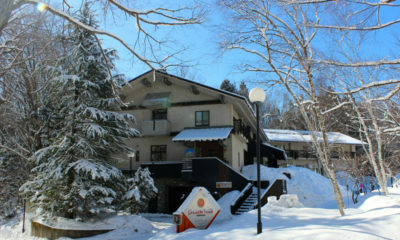 Or, explore nearby restaurants in the Hakuba valley. 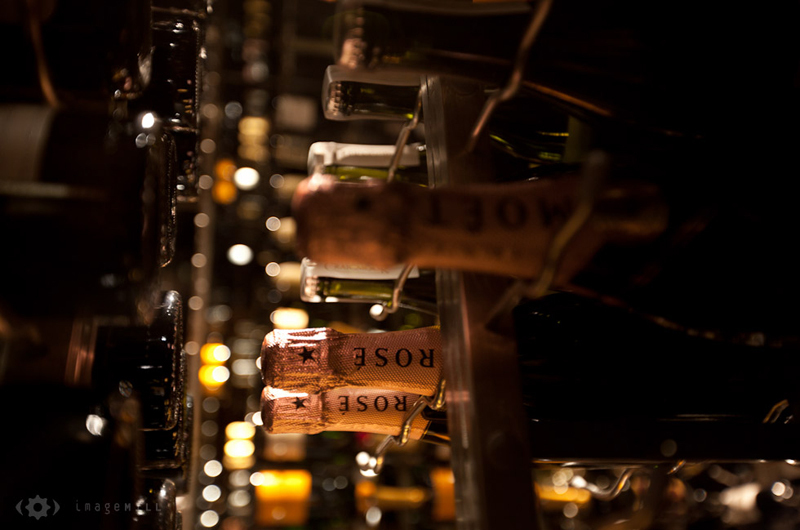 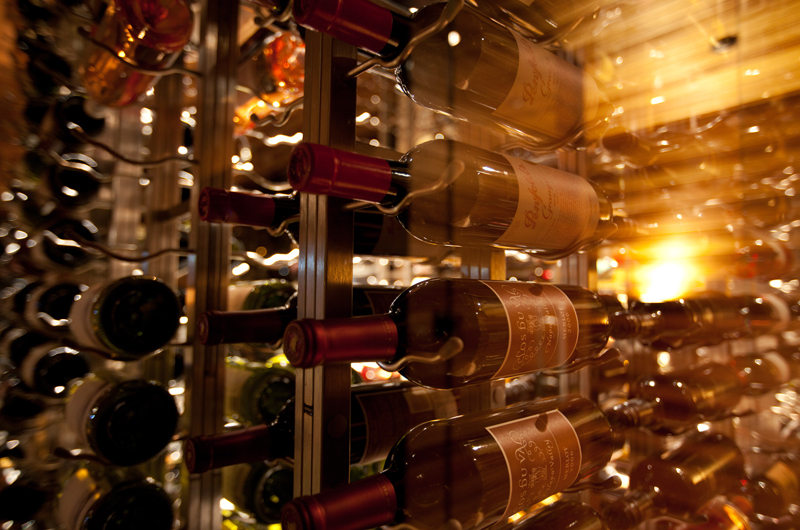 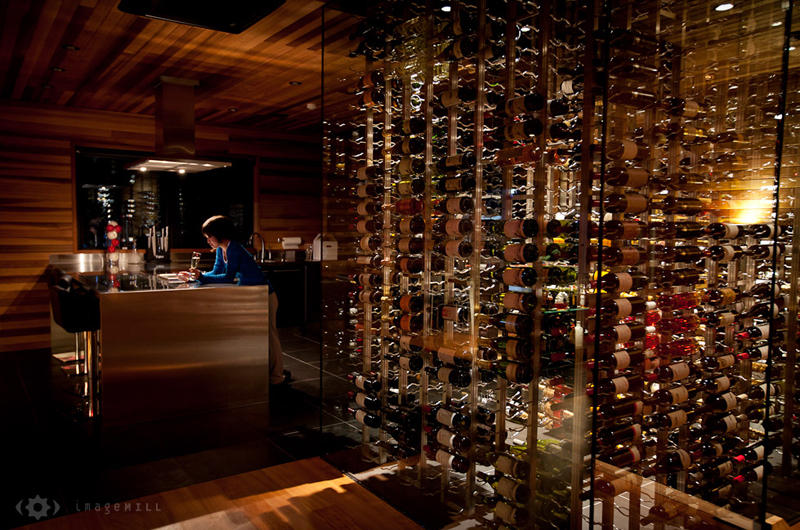 An extensive wine collection in a full-height glass cabinet is yours to peruse and order from.